Baby Comes Home by Dr. Paul Roumeliotis is the ultimate parenting resource guide to ensure your baby is happy, healthy and feels loved. In Baby Comes Home, Dr. Paul Roumeliotis, an expert pediatrician takes a unique approach to baby care by emphasizing what scientific approach already has proven – that what happens early on in a child’s life will affect their overall health later down the road. Baby Comes Home communicates the latest science that explores how positive or negative early childhood experiences can have lifelong consequences. The book begins by describing the vital changes that occur in a child’s brain in the first eighteen months of life. The book then goes on to explain the Science of TLC – that shows that tender, loving and caring relationships will help to positively shape a child’s brain. The book then presents more practical information on safety, baby patterns, immunizations, injury prevention and more. Dr. Paul also describes common illnesses in the first few years of life. Bringing a new child home is hard whether or not you are a new parent or a seasoned parent. Each child is unique and different and you face new challenges with changing opinions and differences in parenting styles. What I like the most of Baby Comes Home is that Dr. Paul presents child care in an open way with no links to certain parenting styles or condemns certain styles. His basis is on loving and caring for your child. That is what counts the most – our children need to know they are loved and cared for. This will help them to become stronger and independent adults. Dr. Paul breaks down each section and highlights the important parts. The information is useful for not only baby but also for older children as well making this a book you will cherish for years to come and not just for the first twelve months of life (ex. pool safety, petting zoo safety,etc.). Dr. Paul also adds practical points that are easily appreciated by many parents to give you real life examples (how to mix cereals and introduce solid foods). One of the biggest concerns I have as a parent is questioning whether or not my child is meeting important developmental milestones. The sooner this is recognized (if they are not achieving these milestones) the sooner you can help your child. Dr. Paul breaks these milestones down and gives you clear developmental milestones by age. Remember if you have a concern to openly speak to your family doctor – they are so important for caring for your child!. 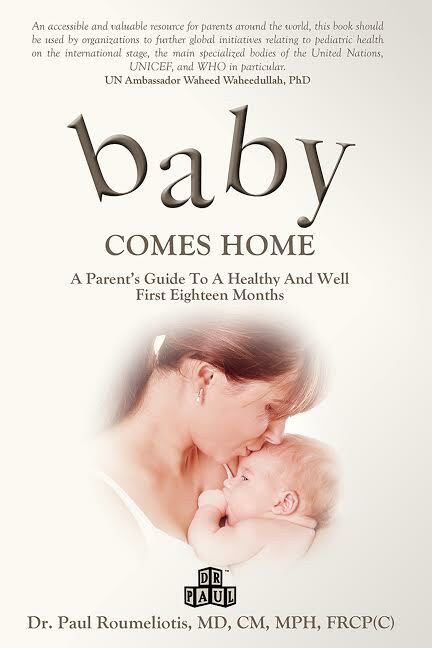 Baby Comes Home will be one of the best investments you make in a parenting resource. A perfect guide for parents and grandparents alike this book will last long into their childhood. You can find the book on Amazon and Barnes & Noble. Dr. Paul is an expert of early child health and wellness and a health communications pioneer. His education content has reached millions online as well as being featured on television and radio. Dr. Paul believes that the future of health care is in communication of health information in a variety of media formats. This vision inspired him to become a writer/publisher/publisher of multi format health and wellness resources. You can connect with Dr. Paul online, on Twitter and on Facebook. This entry was posted in book review, giveaway, review. I worked with new parents so I would enjoy reading this. Thank you for the very nice review! It is very satisfying for me to know that my information is so helpful! I want to win this book because I have a friend expecting and this would be helpful for her.